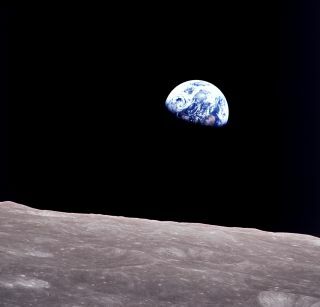 The Earthrise image in the incarnation that became iconic. Chances are good that you've never seen Earth in its entirety, on a planetary scale, with your own eyes. But you've surely seen another human's photograph of just that — like this very image, the first of its kind. Known as Earthrise, it was snapped 50 years ago today during Apollo 8's visit to the moon. The photograph was unplanned — the astronauts simply saw what they saw and took the photographs they felt compelled to take. "Of course they were going to take a picture," Bostick said. "I'm not sure why nobody ahead of time had thought, hey, you know, if you turn to this attitude and look back you're gonna see the Earth. It was kind of a gee-whiz thing that was not a part of the expected science return from the mission." Unexpected and unscientific, Earthrise has nonetheless become perhaps the best-known legacy of Apollo 8 besides the missions that followed. A steady stream of photographs looking back at Earth from space, taken by humans and robots alike, has followed. But Earthrise still has a special power in the way it shows Earth juxtaposed with the barren moon. "That was a really stunning contrast to the guys who were on Apollo 8," John Rummel, a biologist at the SETI Institute, told Space.com. "All the color was on that little orb that was rising on the moon. Everything was there and nothing was on the moon that they could really identify at the time or feel good about — if you like craters, it's a great place, but it's pretty stark." Over the course of the decades of spaceflight that have followed, psychologists studying astronauts' accounts of being in orbit have identified what's been dubbed the overview effect, a striking tendency to focus on the unity of the planet. "It does seem as though people report a shift in terms of how they view the Earth as a whole, and I don't know that we know for sure exactly the neurobiological and cognitive mechanisms through which that occurs," David Yaden, a psychologist at the University of Pennsylvania who studies self-transcendent experiences, told Space.com. "What I think is happening there is there's a perception of vastness, and the perception of vastness is the stimulus that triggers the emotion of awe." That awe, in turn, seems to stop people from falling into their usual patterns of thinking — the mental shortcuts we take in order to survive the flood of new experiences and objects we encounter every day. Being confronted with that vastness seems to trigger our minds to stop and take in new information, creating a silent narrative like, "'Whoa, this is a new one, I'd better actually update my mental knowledge,'" Michelle "Lani" Shiota, a social psychologist at Arizona State University, told Space.com. The image doesn't just convey how good we have it here on Earth — Earthrise also highlights how fragile the planet's life-support systems are. "Before the Apollo program, people didn't have a sense of scale of what it meant to be on a planet floating through the solar system," Som said. "There's really not much that's keeping us alive." That idea of Earth's fragility resonated. "I think that that really sparked the environmental movement, helped it grow," Rushmore DeNooyer, a filmmaker whose documentary on Apollo 8 will air on PBS on Dec. 26, told Space.com. "It seems like we really need to mend our ways in terms of our relationship to the planet because it is fragile in some ways and that photograph really shows it." The first Earthrise image Anders took, while his colleagues were still searching for color film. Coincidentally, just a week and a half before the iconic image was beamed back to Earth, the journal Science published a piece that presented what has become a key idea in environmentalism, "The Tragedy of the Commons." It highlights the challenge of protecting shared resources like clean air and water, where a newer, shinier technology won't do the trick. In the decades that have passed, that idea has been adapted, adjusted and reckoned with. But Earthrise and the feelings it inspires have only become more relevant as Earth's population has risen — from 3.5 billion people when Apollo 8 looked back to more than twice that today. But those billions of humans aren't necessarily good at thinking of their neighbors. "To really think about ourselves as citizens of Earth is something that I think we're still working toward," Jacob Haqq-Misra, a research scientist at Blue Marble Space Institute of Science, told Space.com. "[Seeing this image] may be enjoyable and fun and awe-inspiring, and you might think about it later that day, but I don't think most people have a perception of 'I'm a citizen of Earth' when they're driving to work." He's curious how potential future space developments — establishing a human presence on Mars, or discovering extraterrestrial intelligence, for example — might make that Earthling perspective easier to grasp by creating a group to contrast it against. But he expects that in the decades since Earthrise was taken, we've gotten used to its awe-inspiring vista. "If you have a photograph of Mount Everest in your living room, pretty quickly it will cease to inspire awe," Yaden said. "When it was this new perspective that humans had never seen before, it was probably far more awe-inspiring than it is now." And sure, we could send humans back with instructions to take more photographs. This time, they would be beamed home nearly instantaneously. The chosen few travelers would come back changed forever by their time beyond the bounds of Earth, and would strive, as many astronauts do, to share the experience with other humans. But behind the image would lurk massive amounts of fuel and metal and countless hours of labor. And it, too, would lose its potency over time. Earthrise as the astronauts aboard Apollo 8 saw it during their flight. Or, look at Earthrise from a new perspective. Or rather, an old one: twisted 90 degrees, with Earth off to the left and the lunar surface a wall to the right. That's the way Anders originally saw it, and the way he allegedly displays the image at home. Imagine seeing it for the first time. "Gosh, what a little small nut we are in the universe," Bostick said. "Why can't we all get along together?"